One of the pillars of the Ukrainian government evidence regarding MH17 has been a video, supposedly taken on the border with Russia in Krasnodon. Like the previous information provided about the Buk 512, the information appears to be incorrect. The Ukrainian government has resisted providing much information about MH17 and particularly the movements of the anti-aircraft missile systems under its control. Today evidence is mounting that the video clip they issued – which has been widely used to implicate Russia in the downing of MH17 – may not have been filmed in Krasnodon, on the Russian border, but in Lugansk 50km away. “The film was allegedly shot by a police surveillance squad at dawn on Friday as the truck headed to the city of Krasnodon in the direction of the Russian border. When this footage was taken, whether it does show a BUK, whether it is in the possession of the pro-Russian or pro-Kiev forces, why the full footage hasn’t been released and why the Ukrainian authorities did not reveal the accurate location of the video are questions which have not been answered. The consequence of this latest revelation should be firm demands for full explanations and openness from the Ukrainian authorities. It is clear they wish to ensure that Russia is blamed for the MH17 incident, and are willing to provide partial and inaccurate information to that end. All parties should release the data and information at their disposal and stop playing games. The overall situation in Ukraine is increasingly worrying. 1) The MH17 disaster is being used to justify increasing levels of violence, leading to heavy civilian casualties. 2) The atmosphere in Ukraine is increasingly friendly to the numerous openly fascist militia in the country. 3) Today the Communist Party of Ukraine was banned. Post updated 24/07/2014 – Additional imagery from the intersection has been provided by a local resident. Arsen Avakov has been contacted via Twitter on https://twitter.com/AvakovArsen without reply. @HRIMark @ParisMatch regarding Krasnodon, we have official, on record Ukranian source saying it's the picture's location. Thank you for the update. We have been saying it was in Krasnoarmeisk as per the Russians a few days ago. But then those darn internets users pointed out that Krasnoarmeisk had no trolleybus lines which is visible in background. Arsen Avakov, Ukrainian Minister of Internal Affairs, updated where the video was filmed on his Facebook page. He stated on July 19th that the filming was in Luhansk. See following link and scroll down for post. The following is a screen shot of the translation. What makes no sense is the rout this alleged BUK took to get to Russia (i assume it would have been done with max expediency???) 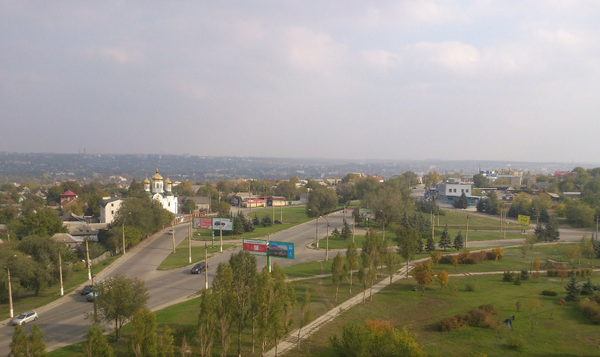 Not that Svobodny, Kujbyshevo and Mezentsev are much closer to Snizne/Torrez (straight upOgorodnaja street, 38 minutes). why drive all over region under artillery fire? I agree it doesn’t make sense, and no evidence has been published to support it either.